Holmarc's model HO-EMP-01 PC based electromagnet comes with water cooling with a built-in chiller unit for continuous duty operation. It has two modes of operation - constant current mode and constant field mode. 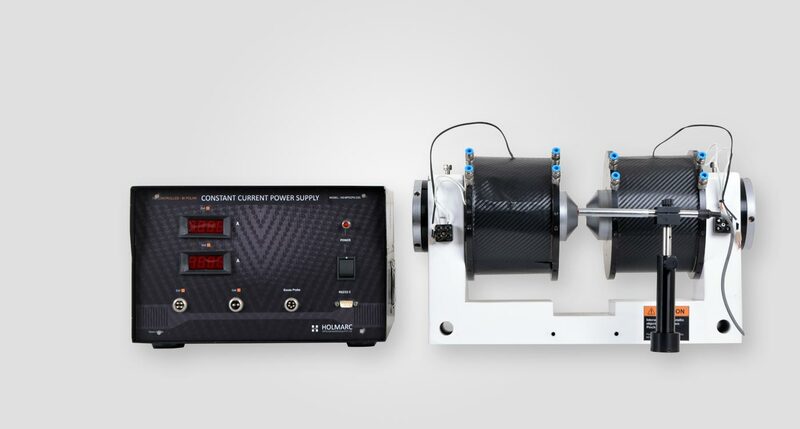 The constant current mode sets a user specified current in the coils, while the constant field mode maintains the user speicifed field strength by measuring the same with a hall probe and adjusting the coil current continuously in closed loop. The In As hall probe comes with a post and post holder making it easy to position at the desired position between or near the poles. The pole gap can be adjusted up to 50 mm manually and the field strength can be calibrated against different pole gaps. The coil temperature is continuously measured to detect over heating. The unit is connected to PC through a serial port or a USB port. The easy to use Windows software facilitates flexible operation. The field strength and the coil current can be controlled through the software.